The Super Rail Band were a conglomerate of Malian musicians originally based at the Hotel de la Gare in Bamako, Mali, adjacent to the railway station. 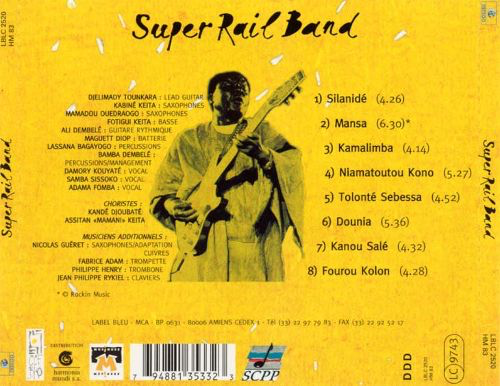 Their most famous ex-member is Salif Keita who went on to have considerable solo success with the best-selling "Soro". Their music is an intoxicating mix of traditional Malian "griot" (a sort of preacher/poet/singer) devotional vocals, usually delivered in a high-pitched nasal style, and West/Central African rhythms, percussion sounds and melodic lilting guitar. All underpinned by an infectious, melodic bass. 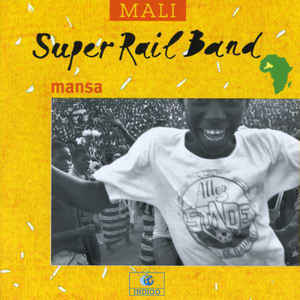 The upbeat, shuffling "Silinadé" provides a perfect example of that, while the more laid-back "Mansa" is superbly slow burning groove, packed full of great guitar, drums and that infectious West Africa atmosphere. If you want to get an instant flavour of what West African music is all about, you can't go far wrong with listening to this track. It is superb. The sound quality is excellent too. When the Nigerian "hi-life"-influenced brass section kicks in, then the griot's voice, followed by the female backing vocals it is just so characteristic of West African music. The delightful "Kalalimba", however, evokes the spirit of South Africa and also Congolese music in its lively, totally addictive, lilting guitar picking sound. It is very much in the style of Ray Phiri, who featured on Paul Simon's "Graceland". There is a lot of that album in this track. It is just an effervescent pleasure to listen to. Try keeping still. "Niamatoutou Kono" is a return to the slow-paced groove of Mali with a beguiling vocal and, once again, a truly superb bass interjected with some sumptuous brass. Near the end the beat picks up a bit and it is just wonderful. When the saxophone comes in - oh yes. Just check out that groovy bass/drum/brass intro to "Tolonté Sebessa". The horn charts on here are simply sumptuous. The guitar too. The music of the Gods. "Dounia" is an effortless piece of rhythmic slow shuffle, with some sublime saxophone. The guitar in the gracefully seductive "Kanou Salé" is marvellous too. "Fourou Kolon" has another captivating insistent beat to it. I will run out of superlatives soon. No wonder so many Western musicians look to this music for influence and inspiration. Superb.